Ko-uta is a genre of Japanese music which developed from the 19th century. It literally means 'little song' and indeed the songs tend to be short, accompanied by the shamisen (a three stringed, long necked instrument). 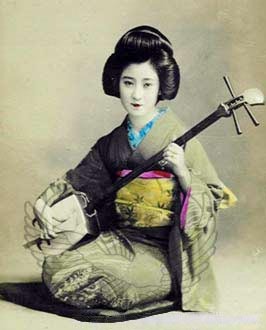 It is most associated with the geisha, for whom learning to master the shamisen is one of the traditional arts. There doesn't seem to be a lot about it in English, other than Liza Dalby's book 'Little songs of the Geisha: traditional Japanese Ko-Uta' (Tuttle publishing, 1979). The author trained as a geisha, and has translated some of the lyrics (she has also put out a DVD, Geisha Blues). Some of them remind me a little of the blues or Greek rembetika, songs of sensuality, longing and intoxication - albeit with more of the natural world imagery found in Japanese lyrics and poetry. They ever renounced the world. I haven't found much of this music online so far - I suspect that I need to be able to search using Japanese characters which I can't read - but there are some examples at http://kouta-renmei.org/english.html. 'Riot shields that project a wall of sound to disperse crowds will reduce violent clashes with police, according to a patent filed by defence firm Raytheon of Waltham, Massachusetts. The device looks similar to existing riot shields, but it incorporates an acoustic horn that generates a pressure pulse. Police in the US already use acoustic devices for crowd control purposes that emit a loud, unpleasant noise. The new shield described by Raytheon produces a low-frequency sound which resonates with the respiratory tract, making it hard to breathe. According to the patent, the intensity could be increased from causing discomfort to the point where targets become "temporarily incapacitated". Acoustic devices haven't seen wide adoption because their range is limited to a few tens of metres. The patent gets around this by introducing a "cohort mode" in which many shields are wirelessly networked so their output covers a wide area, like Roman legionaries locking their shields together. One shield acts as a master which controls the others, so that the acoustic beams combine effectively'. 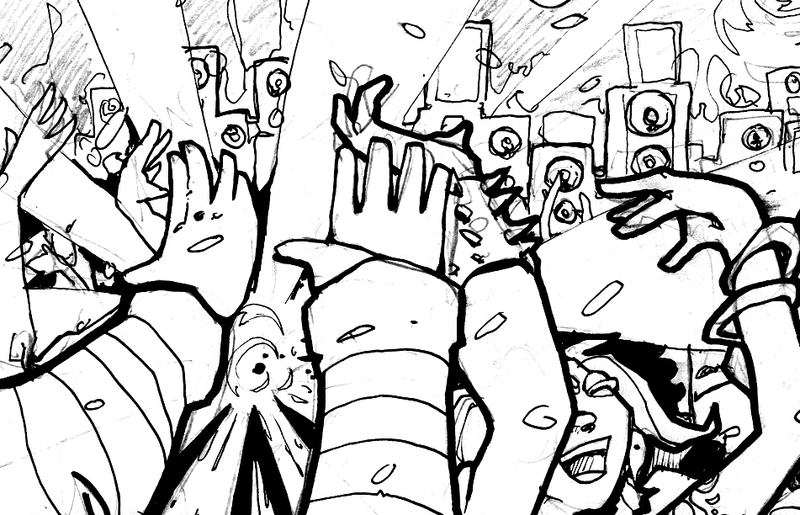 You will notice small objects, such as ornaments, oscillating. You will notice a vibration in your diaphragm. You will hear a distant hissing in your ears. You will feel the need to vomit. There will be bleeding from orifices. There will be an ache in the pelvic region. You may be subject to fits of hysterical shouting, or even laughter'. See also: Kathy Acker - Empire of the Senseless; Sonic Cannon in Pittsburgh. Thirty years ago last week, on December 16 1981, nine striking miners were killed by the state at the Wujek Coal Mine in Katowice. Three days previously martial law had been declared in Poland by General Wojciech Jaruzelski and the miners were on strike against military rule. Tanks, water cannon and then live ammunition was used in the clashes between police, troops and strikers. The repression successfully pacified the movement in the short term, but the memory of the massacre fired up the next big wave of strikes in 1988, and within ten years of the killings most of those responsible were out of power. Some of those directly implicated in the massacre later went to prison. Still the collapse of the Soviet Bloc precipiated by the Polish strikers and similar movements elsewhere did not unseat all the generals, secret policeman and bureaucrats in these countries. Some just changed their badges and got on with business as usual, nowhere more so than in Kazakhstan where the former head of the local 'Communist' Party Nursultan Nazarbayev became President of the newly independent country in 1991, holding on to power ever since. 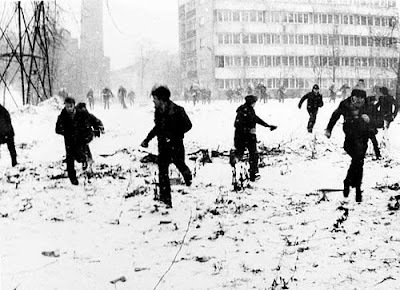 Thirty years to the day since the Wujek massacre, on December 16 2011, tanks and military forces were used in battles in Kazakh city of Zhanaozen. More than 3,000 people assembled in the city in support of oil workers who have striking and protesting since May in support of better living conditions. Police and special forces attacked the meeting and opened fire on the strikers and their families. At least 10 people are reported to have been killed. According to this report at libcom 'the Kazakh oil field workers established a “tent city”, in Zhanaozen’s main square, in June. When police tried to break it up in July, 60 of them covered themselves with petrol and threatened to set themselves on fire. Friday’s massacre took place in the same square'. Say what you like about Sting, but to his credit he cancelled a performance at a government-sponsored festival earlier this year in solidarity with the strikers, saying 'The Kazakh gas and oil workers and their families need our support and the spotlight of the international media on their situation in the hope of bringing about positive change'. - Tony Blair, the former prime minister, is being paid millions of pounds to lobby in the Kazakh government’s interests. Many other British businessmen and politicians help, too. Richard Evans, the former chairman of British Aerospace, is chairman of Samruk-Kazyna, a state-owned holding company that controls a big chunk of the Kazakh economy. - The oil produced in Kazakhstan is traded in the offices of big oil trading companies and international oil companies in their London offices'. Tomorrow - Wednesday 21st December 2011, 12 noon - there's a solidarity picket at the Kazakh-British Chamber of Commerce, 62 South Audley Street, Mayfair, London W1K 2QR. 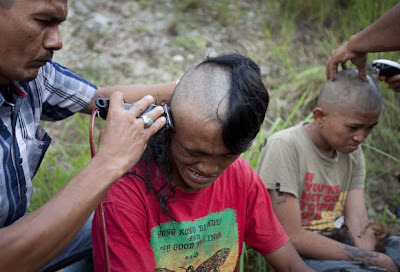 /Dozens of young men and women have been detained for being "punk" and disturbing the peace in Aceh, Indonesia's most devoutly Muslim province. They are being held in a remedial school, where they are undergoing "re-education". Rights groups have expressed concern after photographs emerged of the young men having their mohawks and funky hairstyles shaved off by Aceh's police.They look sullen and frightened as they are forced into a communal bath. Aceh police spokesman Gustav Leo says there have been complaints from residents nearby. The residents did not like the behaviour of the punks and alleged that some of them had approached locals for money. Mr Leo stressed that no-one had been charged with any crime, and there were no plans to do so. They have now been taken to a remedial school in the Seulawah Hills, about 60km (37 miles) away from the provincial capital Banda Aceh. "They will undergo a re-education so their morals will match those of other Acehnese people," says Mr Leo. But activists say the manner in which the young people have been treated is humiliating and a violation of human rights.Aceh Human Rights Coalition chief Evi Narti Zain says the police should not have taken such harsh steps, accusing them of treating children like criminals. "They are just children, teenagers, expressing themselves," she says. "Of course there are Acehnese people who complained about them - but regardless of that, this case shouldn't have been handled like this. They were doused with cold water, and their heads were shaved - this is a human rights violation. Their dignity was abused." ...Aceh is one of the most devout Muslim provinces in Indonesia, and observers say it has becoming increasingly more conservative since Islamic law was implemented a few years ago' (BBC News, 14 December 2011). 'Lyme Regis police blocked an illegal rave that was set to attract hundreds of revellers after it was advertised on the internet. The party was publicised on social networking site Facebook as a public event with camping, fireworks and live music. Police in Lyme Regis received a tip-off about the event and discovered that various DJs were lined up to perform in a field from 8pm to 6am. Community beat manager PC Richard Winward said: “We had no idea where it was so we made some inquiries and discovered who the organisers were. We discovered that it was going to happen on Saturday, November 19 in a field off the A35 at Wootton Fitzpaine. We realised of course that it must not go ahead because it was illegal and would have caused huge disruption to people living in the area.” The organisers were three 19-year-old men from Lyme Regis, Umborne in Devon, and Exeter. PC Winward said the organisers agreed to postpone the rave until they obtained the correct licences and permissions. 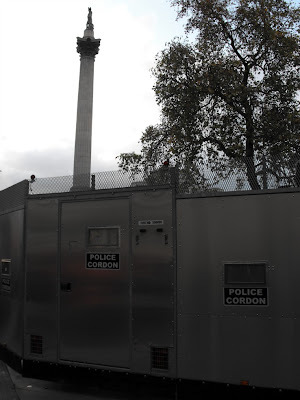 But some determined revellers still threatened to turn up at the field, so police were forced to blockade the area'. 'An illegal rave in a disused industrial unit in Hampshire has been shut down. Police officers followed social media websites to locate the site of the rave which was being set up at the Walworth Industrial Estate in Andover. About 70 officers broke up the gathering by dispersing people travelling to the music event on Saturday night. Three men, from Wales, Gloucester and Hampshire, were arrested and sound equipment was seized by police. A 36-year-old from Llanishen, Wales, and a 19-year-old from Alton, Hampshire, were both arrested on suspicion of criminal damage and using electricity without authority. A 37-year-old from Gloucester was arrested on suspicion of using electricity without authority'. 'Thames Valley Police has charged a 20-year-old man with public nuisance following a rave at Ivinghoe Beacon in October. [RB] of Haverhill, Sussex, was charged with the offence yesterday and is due to appear at Aylesbury Magistrates’ Court on December 19. The offence relates to an illegal rave attended by more than 600 people which took place in the early hours of October 2'. 'Police arrested seven people and seized sound equipment after breaking up an illegal rave at Nuctombe Bottom near Timberscombe recently. More than 600 people descended on the site without permission, prompting police to move in and break up the rave following complaints from angry residents. Police said the noise was so intense that it could be heard up to four miles away in Minehead'. 'Plans for a New Year’s Eve rave in Colne have been refused after strong objections by Lancashire Police. Promoters Small Trees wanted to stage the event at an industrial unit off Burnley Road, Primet Bridge but PC Mark Driver, Pennine policing division licensing officer, raised concerns on how an expected crowd of up to 500 could be managed. Further worries centred on internet promotional promises of £2 drinks for everything except spirits. The borough’s licensing committee issued a counter-notice against the event'. 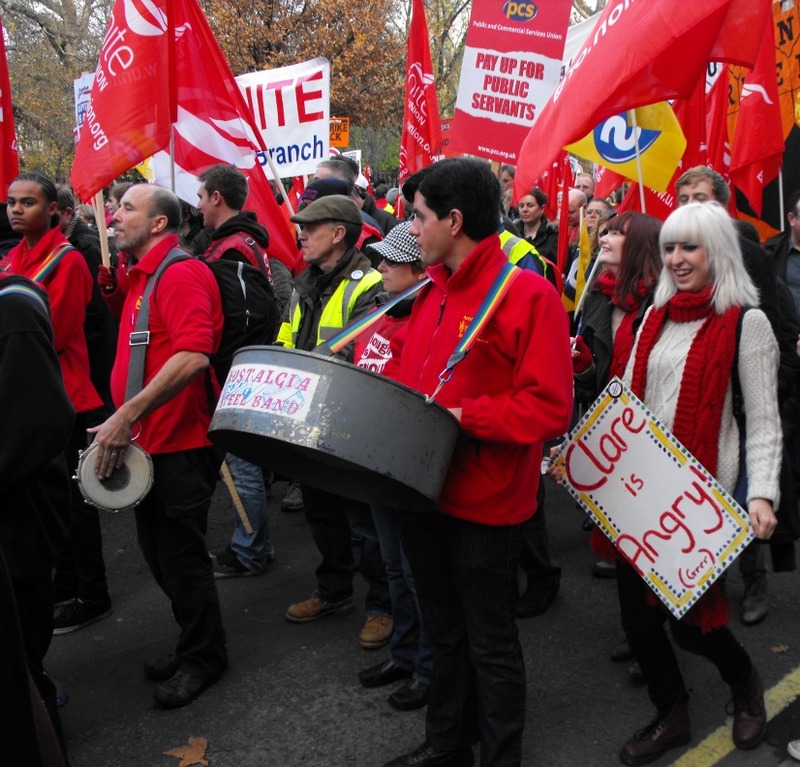 I went on strike on Wednesday November 30th against changes to pensions for public sector workers - against in short having to work for longer and pay more to receive less. 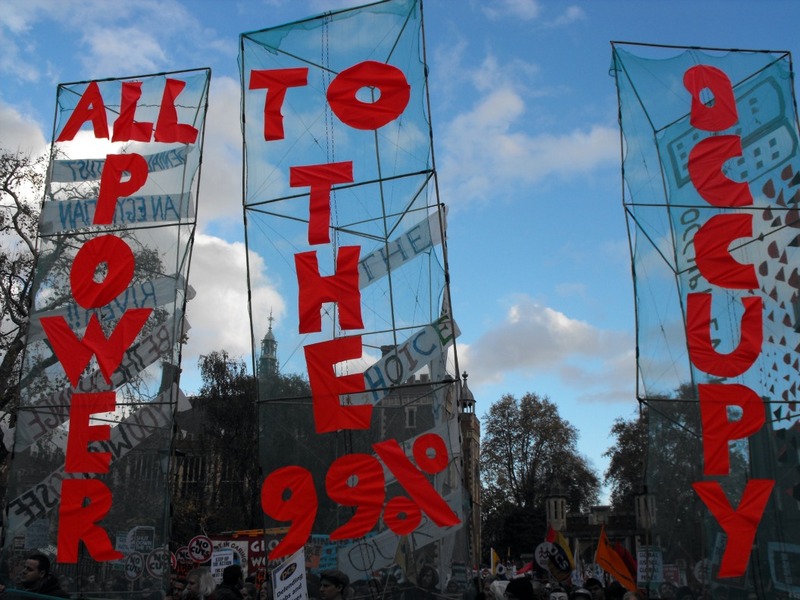 The goverment initially tried to play down the numbers on strike - but even by their own figures around a million were on strike, the largest number for at least 30 years. The unions suggested the number was more like 2 million. 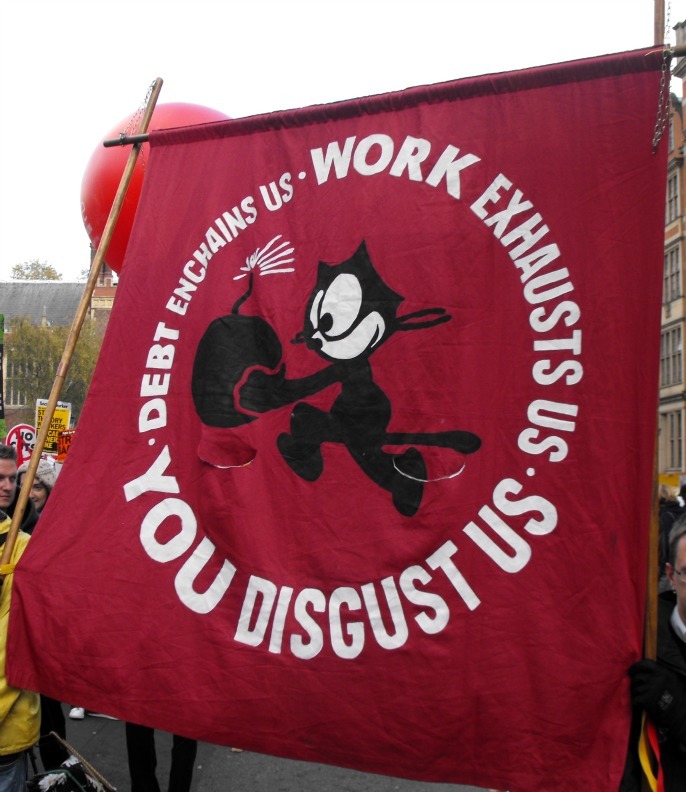 Started to write an in-depth post about capitalism, crisis, the weakness of both the state and its oppenents etc. But that will have to wait for another day, probably another year! 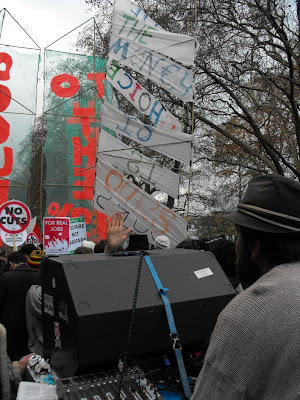 Instead, here's some pictures and short commentary from the strike in London - all taken on the demonstration in central London (attended by up to 50,000 people) unless otherwise stated. 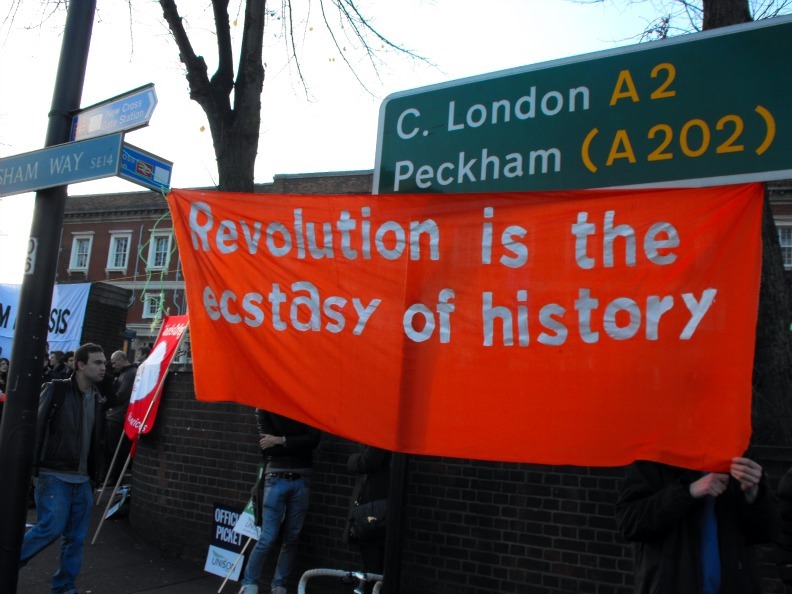 'Revolution is the ecstasy of history' - banner on picket line at Goldsmiths College in South London. 'One Step Beyond' by Madness! Nostalgia Steel Band on the march. 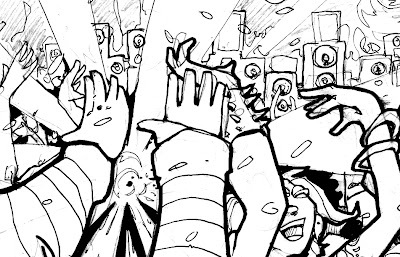 Clare is angry - and she's not alone! 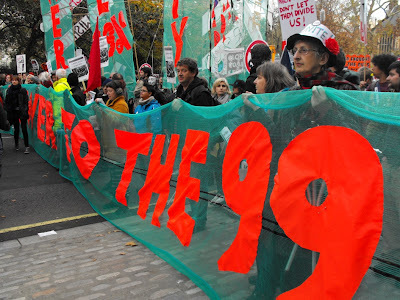 After the main demonstration, 21 people were arrested during an occupation of Panton House near Leicester Square, headquarters of mining company Xstratahe whose CEO Mick Davies was said to be the highest compensated CEO of all the FTSE 100 companies in the last year, receiving pay and shares ot a value of £18,426,105. 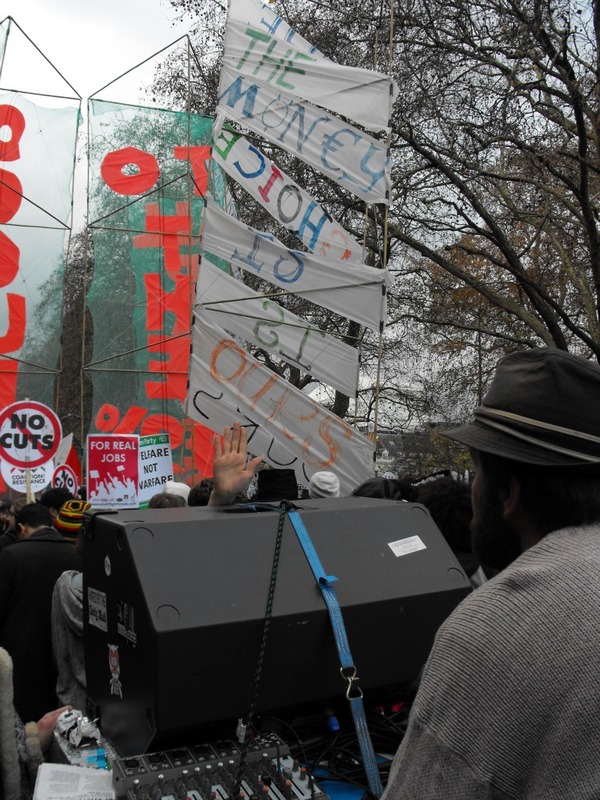 37 people were also arrested in Dalston, ironically outside the CLR James Library. Seemingly they had been part of a mobile group with sound system moving between picket lines in Hackney. See also: The Big Strike in South London for more photos and reports. Occupy protesters in Montreal were dismayed to find they had been marked by police with a special ink that is only visible in UV light after being arrested during a raid of Victoria Square Friday. Police told CTV Montreal they borrowed the technique from bouncers at clubs and bars and it is meant to mark protesters who might return to the square. This morning we tested my hands under a black light and sure enough there was a number 2! The freaky thing is this is IN my skin, washing my hands and scrubbing with abrasives will not get this off…. perhaps in several months of my skin cells renewing themselves if will eventually fade.What ever ink that is in there is irritating my skin slightly and its a very terrible feeling that they put a substance in my body with out my consent and then later lied about it' (Salon, 30 November 2011). 'In the end, Occupy Montreal didn’t go out with a flash bang, but with a bass line. Exactly six weeks after the global Occupy phenomenon came to the city, Victoria Square was a place transformed, then transformed again. Gone was the intricate maze of shelters and structures. Gone were the kitchen and library areas. And gone were many of the inhabitants of the tent city, kicked out by members of the Service policière de la Ville de Montréal on Nov. 25. Today, the tents have been torn down, and the inhabitants have all gone back to wherever they came from. All that’s left is the question that’s been levied at the movement since the beginning: what’s next? What do you do when a protest predicated on the physical occupation of a location no longer physically occupies that space?